Back in 2014, we yearned for more video coverage of WUCC 2014 when there was a fraction of broadcasted games. "proper resources must be dedicated to video capture our sport. Ultimate deserves it. The players deserve it. And, the fans deserve it." In 2014, 22 total WUCC games - including masters division - were broadcasted. In 2018, 70 more ultimate games than 2014 were streamed for a total of 92* games which calculates to coverage of ~15% of all (628) played games. Each division saw a major increase in coverage. 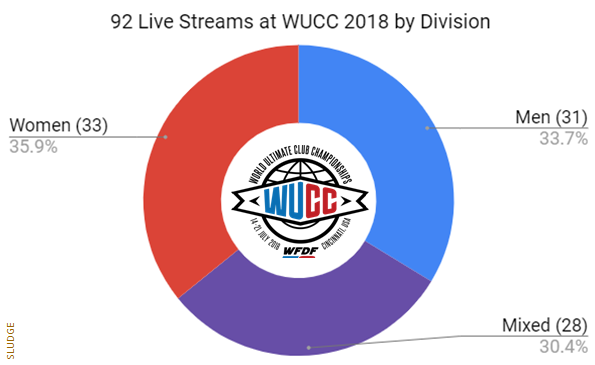 Men's division had 21 more broadcasted games at WUCC 2018 compared to 2014. The mixed division had 25 more broadcasted games in 2018 compared to the 2014 WUCC event. Women's division had 26 more broadcasted games in 2018 compared to WUCC 2014. The technology for streaming live games has improved since 2014 and the location of the 2018 event - Cincinnati (USA) - certainly boosted the ability to offer so many more ultimate games to viewers than in 2014 (Lecco, Italy). WFDF announced more event coverage in March 2018 and overdelivered on its promise with knowledgeable on-air personalities plus a variety of online media portals via the Olympic Channel, Ultiworld, Fanseat, WFDF's YouTube channel, and WFDF Facebook. The World Flying Disc Federation's World Ultimate Club Championships was a massive event. Players seemed to review positively about the tournament. WUCC 2018 felt like WFDF finally embraced the opportunity of engaging ultimate fans from around the world seeking to follow the action remotely. Hoping the 2018 live streaming model continues for WFDF's next ultimate championship events. *The continuation of nighttime indoor semifinals streams were not double counted. NYT: Can Ultimate Frisbee Save the World?